IT WORKED FOR THE OTHER GUYS… by Jim Corbran, Automotive Columnist Hyundai has just announced that its Genesis nameplate will become a separate brand to compete with the world’s leading luxury car brands. If you’ve been around for a while, this is how Lexus (Toyota), Acura (Honda), and Infiniti (Nissan) got started years ago. Right about that same time Mazda also had a separate luxury nameplate (Amati) in the pipeline, but it fizzled out before launch and cars which were to be sold as Amatis ended up as Mazdas, or under the Eunos or ɛ̃fini nameplates, two brands sold only in Japan. Hyundai expects to launch six new Genesis models by 2020, which will compete in the world market as a stand-alone brand. Names will be alpha-numeric (G70, G80, G90 etc.) depending on the model segment. They’ve hired a new design team, which will be headed by Luc Donckerwolke who was previously responsible for design at the Audi, Bentley, Lamborghini, SEAT, and Škoda divisions of the Volkswagen group. Initially the new Genesis line will go on sale in the Korean, Chinese, North American, and Middle Eastern luxury car markets before eventually expanding to Europe and other parts of Asia. Hyundai hasn’t said that the Genesis line will be totally removed from Hyundai facilities, but expect there to be a distinct separation between the two brands at the dealerships. I can’t imagine it being successful any other way. The current Genesis models, a coupe and a four-door sedan, are compared to the Mercedes E400, Infinit Q70, Audi A6, and Cadillac CTS in their media packet, so you can see who they are competing with. Nowhere though, did I read any mention of the Hyundai Equus, a $61,000 sedan currently positioned above the Genesis in the Hyundai hierarchy. 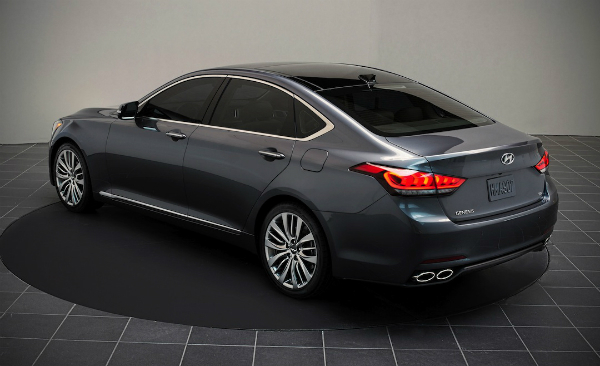 I’m sure it will become one of, if not the flagship, new Genesis models, probably renamed and refreshed. Should be interesting. ### The post IT WORKED FOR THE OTHER GUYS… appeared first on Buffalo Cars.